Smiley faces are helping Apple push its latest iOS 9 software out to more iPhone and iPad owners. The adoption rate for iOS 9 stands at 66%, meaning Apple's latest mobile operating system is now found on nearly two out of every three compatible devices. This is a jump from a 61% adoption rate two weeks ago, and the jump could be partially attributed to Apple's launch of the iOS 9.1 software update, which brought more emoji to the keyboard, a feature that could entice a younger audience to update their devices. Apple announced in September that iOS 9 had the fastest adoption rate of any iOS release. Unlike Android, Apple controls when OS updates are pushed out to users without having to go through the carriers, resulting in more timely updates. For users, this means that bugs are fixed more quickly and security glitches get patched before they become larger threats. The strategy will also be adopted by Microsoft, which will also push out updates to Windows 10 Mobile directly to consumers without having to go through the carriers. Apple is working on iOS 9.2. It has already begun seeding the second beta of iOS 9.2 to developers. The second most used version of iOS is iOS 8, with Apple reporting adoption at 25%. All iOS versions older than iOS 8 are used on 9% of devices. The benefit to developers for rapid, wide-scale consumer adoption is that third-party apps may only need to be updated to support the most recent major releases of iOS, rather than multiple editions scaling back several years. iOS 9 debuted on the iPhone 6S and iPhone 6S Plus. 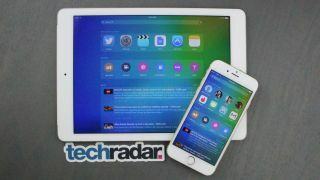 Additionally, it will also debut on the iPad Pro when that devices becomes available this month.